Background: Polycystic ovarian syndrome (PCOS) is a complicated endocrine disorder characterized by metabolic and reproductive disorders. This syndrome is the most common cause of infertility. The aim of this study was to investigate the effect of Coenzyme Q10 on anti-Müllerian hormone (AMH) level as an indicator of PCOS patients. Methods and Methods: We designed an interventional clinical trial study on 30 women with PCOS. The variables studied were age, marriage status, number of pregnancies and history of PCOS. All patients were evaluated for AMH by Electrochemiluminescence Immune assay. Patients with a serum AMH level of 5 and above were treated with CoQ- 10 pills 100 mg daily for 3 months. Results: The mean age of patients was 23.3 ± 4.7 and the duration of PCOS was 4.76 ± 0.76 years. 55% of patients were single and 78% of cases referred with Oligomenorrhea. 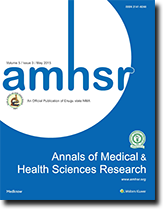 The mean level of AMH in patients with PCOS showed that Q10 significantly decreased the AMH (2.2 ± 10.36 vs. 1.4 ± 8.57, p value = 0.02). Conclusion: The effect of Q10 intake as an inexpensive and effective therapy significantly reduced the level of AMH in patients with PCOS.